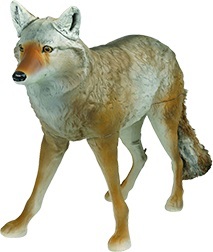 The most realistic coyote available! The faux fur tail with wire frame is posable and moves in the wind. The Lone Howler's bungee leg system allows the decoy to be easily transported and placed in a sitting or laying position. Simulate captured prey by attaching a white rag or rabbit pelt to the snout to elicit an instinctive response from approaching coyotes. Innovative, sturdy, bungee leg system. Legs easily folds & strap, compact, easy transport. Rear leg accepts electronic call and scent pads.